Build any blogging website with easy with real-time WordPress Customizer preview and 26 reusable homepage blocks with drag and drop, manage your posts layouts and styles to create unique look & feel, use 11 available Blog listing layouts to showcase your posts in different ways, customize your theme using multiple Theme Settings with real time preview in WordPress customizer, navigate within blog posts without page re-loading with Ajax Load More feature, import any demo website with 1 click… The list of Saxon amazing brand new features is just go on! We have dedicated support team to provide email to email support for Saxon customers. Play around with 26 homepage blocks, in any style, position or combination, to get the look that works for you, including posts, content blocks, sliders, categories, and more! You can use each block multiple times in different positions, and even assign posts to groups to be displayed in a particular block on your homepage. With live preview you can check your changes as you go along, for the perfect finish. Even beginners will find this theme easy to use, navigate and customize. You don’t need any CSS/HTML knowledge to get the most out of Saxon and create a personal blog or magazine WordPress site that stands out from the crowd. Your download includes a video installation guide and step-by-step documentation to help you take advantage of all the outstanding features that Saxon has to offer. However, if you experience any problems with this theme, we are on hand to provide dedicated support as you bring your blog or magazine site to life. We’re always working to make our themes even more powerful and feature-packed, so when we add something new you’ll be the first to know, with free updates for life! 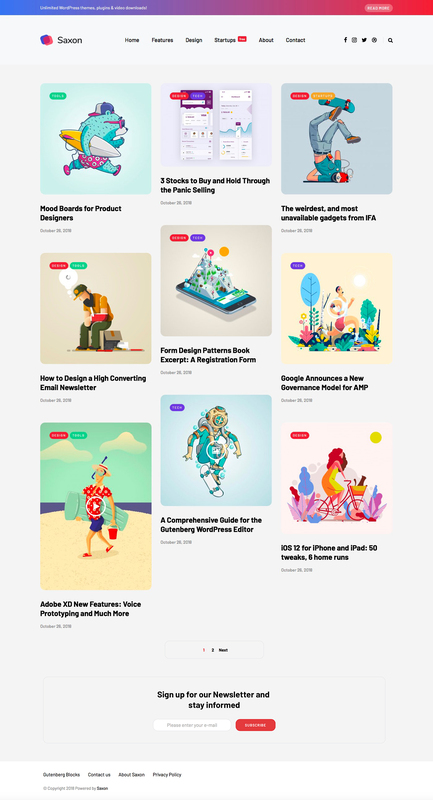 Saxon – Create & Curate. Theme compatible with WordPress 5.x, WooCommerce and WPML. 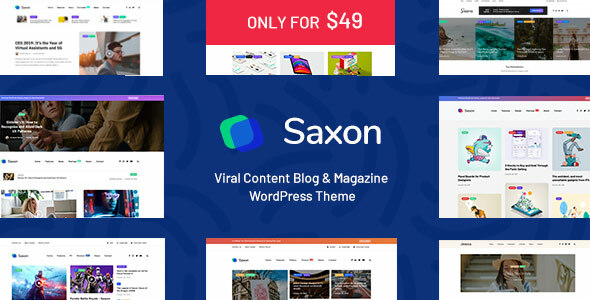 Saxon theme is a extremely fast (up to 100/100 Google Page Speed Score - RUN TEST), aesthetic, clean, modern and very flexible WordPress Blogging Theme designed especially for bloggers. To upgrade your theme to newer version just add new and replace changed files (see changelog in Documentation/release-history.html inside FULL theme ZIP archive). Added - New Theme Demo 16 for import - "Newspaper"
Added - New Theme Demo 13 for import - "Fashion"
Fixed - Gutenberg plugin will be automatically deactivated if you have it installed on WordPress 5.x, because it's already built in to WordPress and will give conflicts if you use it together. You can remove Gutenberg plugin from Plugins because it's no longer needed. Added - New Theme Demo 12 for import - "Travel"
Added - New Theme Demo 11 for import - "Christmas"
Added - New Theme Demo 10 for import - "Marketing"
Theme compatible with WordPress 5.x, WooCommerce and WPML. And we make sure it will work with any future WordPress releases.